Looking for professional floor sanding service that’s quick, clean and affordable? We get in, get the job done, and get out, leaving nothing but beautiful timber floors behind. For over 27 years, we have been transforming timber floors in Brisbane. FLOOR SANDING BRISBANE - WHAT WE DO. Great, give us a call to find out how quick, easy and affordable specialist floor sanding can be. Restoring your boards to showroom condition doesn’t have to be stressful, expensive or time consuming. In fact, when you work with us, the experience is anything but. Thanks to state of the art, dustless equipment – and more than 27 years in the industry – our floor sanding process is quick and easy. Perfect for all timber floors, as well as parquetry and cork, it’s a patented process that delivers outstanding results every time. To learn how easy and affordable transforming your timber floors can be, get in touch today. Floor sanding from the inside out. Brisbane weather’s great for outdoor entertaining, but not so great for the longevity of your deck. Thankfully, restoring your boards to their beautiful best – and keeping them that way – isn’t as big a deal as you’d think. Simply choose your preferred finish and we’ll get to work – your deck can be ready to face the elements in as little as two days. Contact us for an obligation free quote today. Dreaming of beautiful timber floors for your home, office or commercial premises? They’re not out of reach. 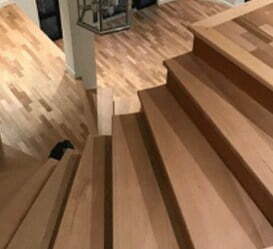 In fact, we can install custom timber floors in as little as a day, at a price you can afford. Ready to get started? Give us a call and get an instant quote today. The healthy choice for your family, your timber and the environment. Want to polish your timber floors the all-natural way? With our non-toxic natural oil finish, you can. Safe for kids, pets, allergy and asthma sufferers, it’s the environmentally friendly way to beautify your timber floors. Want to learn more? Call us today to get started. We don’t just sand and polish timber floors – We also sand and polish parquetry. Just like timber floors, parquetry flooring can become worn and damaged over time. But under the stains and scratches lies a floor full of potential. Here’s how we can sand and polish your parquetry, restoring and reviving the beauty and brilliance of days gone by. Brisbane Timber Floors are your Commercial floor sanding experts. Contact us now to discuss your commercial interests.